Links SW2—SW3 and SW2—SW4 will be blocked by the SW3 and SW4 switches respectively. Traffic from every device connected to any VLAN configured, will be travelling only these three links. This is a default MSTP behaviour. To overcome this negative issue, MSTP protocol should be properly planned and configured. By default this protocol runs only one STP instance and maps all VLANs to this instance. To utilize all physical links equally, additional instances should be added. Let’s assume that we have two VLANs: 100 and 200. 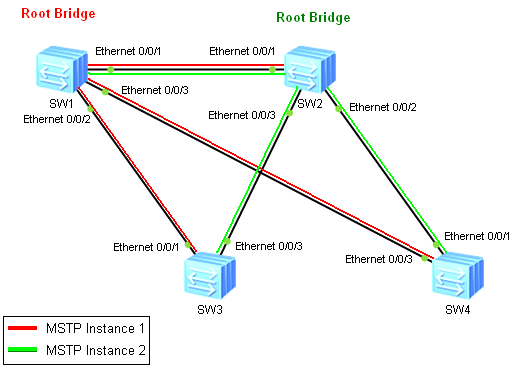 By default both VLANs will use the same logical STP topology as in the picture above. This is because both VLANs belong to the same MSTP Instance, which was determined by the one Root Bridge placement (SW1 in our case). 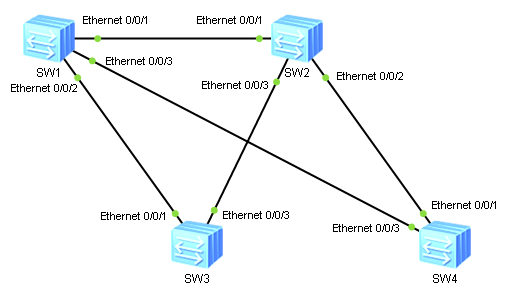 map VLAN 100 to the first MSTP Instance and VLAN 200 to the second MSTP Instance. Info: This operation may take a few seconds. Please wait for a moment....done. As you see above, by default all VLANs are mapped to the MSTP Instance 0. This is the reason that all VLANs use the same logical topology to forward traffic between devices. Bridge priority equals to 4096, this is because this switch is configured as the Root Bridge Secondary for the MSTP Instance 2. As you see, RegRoot ID is different than Bridge ID. This is because SW2 was configured as the STP Root Bridge Primary for the MSTP Instance 2. All ports in MSTP Instance 1 have a Designated role. This means that SW1 is the Root Bridge for this Instance. RegRoot field points to SW1’s MAC address. This means that SW1 is the Root Bridge for MSTP Instance 1. Bridge ID followed by the 4096 means that SW2 is the Root Bridge Secondary for MSTP Instance 1. All ports in MSTP Instance 2 have Designated role and Forwarding state. This switch is the Root Bridge for MSTP Instance 2. 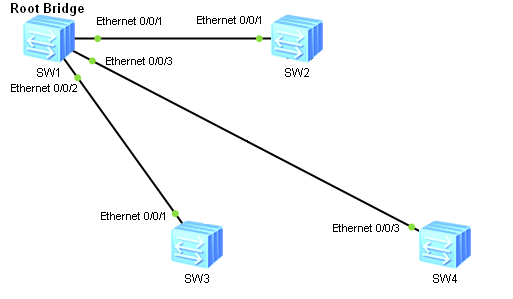 Interface Eth0/0/3 is blocked by the STP Instance 1 and Eth0/0/1 blocked by the STP Instance 2. Which ports are blocked on the SW4? In the MSTP Instance 1 Eth0/0/1 is blocked, and Eth0/0/3 in MSTP Instance 2.